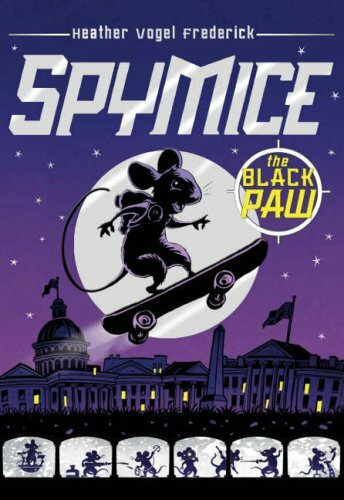 Spy Mice by Heather Vogel Frederick – Animal Fiction/Mystery – 4th grade and up – I enjoyed rereading this and reading aloud the book to my son, took way too long to read it aloud but we enjoyed all the twists, turns, and adventures throughout! Glory Goldenleaf is a mouse who works at the spy museum going on secret, dangerous missions and helping the mouse world with various challenges including receiving a black paw, threat of death, from her family’s nemisis. It was fun to follow her skate boarding, creative solutions, and flying on pigeons adventures. I especially loved how she found her partners. This was a really cool, fast-paced and detailed story. It was definitely more of a plot-based story than a character-driven story, but there’s ROOM for more development in the rest of the series. The writing and ‘world-building’ were great. Would I read more by this author? Yep. Would I recommend this to others? Sure. Kids would really get into this.See the full review on my blog, Awesome Book Assessment. I choose this book because I accidentally checked out the third book in the series from the library. The book was a good spy novel. it was also very suspenseful and exiting. I learned from the story that family is the most important thing in the world. I would use bits of the authors writing style like her excitement and suspense in my own writing. I was surprised that the story did not show mice as pests it showed them as intelligent creatures with advanced society. I was surprised at how badly rats were portrayed in the story. Fun adventure story, filled with the cutest of mice, bravest of kids, and most evil of rats.The whole plot beamed with intrigue. The spy agent theme made the story come alive! The author really included some fun ideas for what mice would do if they lived as we do -- it is these details that truly made the story charming and fun. This is the first book in a series and it was an okay read but I think it's too "cute" to cash in on the spy craze. The story would be better without the talking mice/human interaction and more focus on mice spy gadgets. I won't be pursuing the rest of the series. Read with my boys. One gave it 4 stars and the other gave it 3 stars, so this became a 3.5 stars book for us. Very cute book about spy mice in the International Spy Museum. Being a DC Metro area gal, I got a big kick out of reading about the mice visiting all different parts of the city. a pretty good book and something i'd recommednd reading in your spare time for grades 4-6??? Ryan loved this book! I love reading with him. This book is very cool. I like how mice and humans work together to fight rats. I think mice like these will happen 20 years later. A cute story, but I won't be reading the rest of the series. Glory's dad looks so young that I almost thought he is Glory's brother! Also, I believe that B-Nut cares more about Glory than Chip do.